During the upper years of Key Stage 2, children should move on from learning about growth and nutrition in green plants to studying the theories behind plant reproduction. They should learn about the parts of a flower and the role that these parts play in the life cycle of flowering plants. The purpose of a flowering plant is to create seeds for reproduction, to ensure the survival of the species. It consists of a floral outer layer and an inner reproductive structure (see small poster). 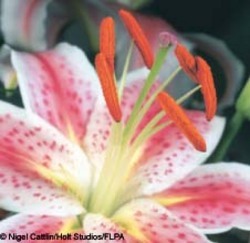 The transfer of pollen from the stamen to the stigma is called pollination. Some flowers self-pollinate but most need pollen from another flower of the same species. This is called cross-pollination. Pollen is usually carried from plant to plant by insects or by the wind. Wind-pollinated flowers are usually small and dull while those that need to attract insects for pollination do so with bright colours and alluring scents. Plants also attract insects with food, in the form of nectar (see the ‘Plant pollination’ sheet).